I came across this simple writing sheet that I created two years ago when I did make-your-ending stories with my sixth graders. We actually used it twice: first, as a collaborative writing prompt, where one student began a story and then passed it along to someone else, who then branched it out and passed it, etc. Second, it became a graphic organizer for their own stories, which we later published on our wiki site. It’s nothing fancy, but it is a good starting point for this kind of branching story. You can download the organizer or view it here. 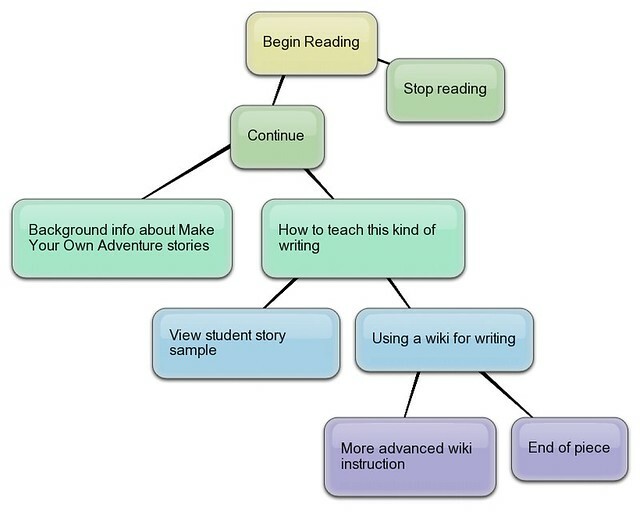 I also found this concept/site map that I had created for other teachers to explain how to teach Make Your Own Ending stories. The map is part of a website that I had created called Threaded Adventures. It’s still a valuable resource, for me. 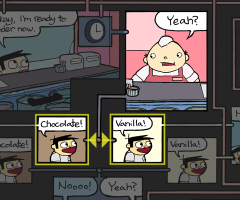 It all starts with the choice of a vanilla or chocolate ice cream cone, and from there, Jason Shiga’s imaginative graphic novel/interactive story app called Meanwhile moves into visual high gear, allowing the reader/player to make choices in the story branches. Most of the branches lead to disaster. One will not and the ultimate goal is to find that branch that will lead to a happy ending. All of the branches have doses of humor and visual artwork that will engage you on a variety of levels. Shiga built the app (and the app is inspired by the graphic novel of the same name, which also floored me when I reviewed it for The Graphic Classroom) around the concept of the “infinite canvas” — a concept in comics that forces the reader and writer to “think big” by expanding the story beyond what can be seen and what can be experienced. Meanwhile takes advantage of that idea (and even did so in a creative way with the book) by allows the reader/player to see various paths of the story. You literally zoom over parts of the story map as you connect with parts of the story based on the choices you make. More than once, I was thinking, what was that part of the story? as the window blew past some frames I had not yet viewed. Instead of keeping everything hidden and out of sight, you can see elements of the story map. In a lot of ways, this visual storytelling strategy is very different from the other interactive fiction stories and apps that I have been reading/playing in the past two weeks. The story has to do with a boy, Jimmy, who stumbled into a factory of a professor, whose been creating devices that could be used to destroy the world, or not destroy the world. So, which will you choose? Your decisions are what lead you along various branches of the story in Meanwhile. The downside is that Meanwhile is an app that costs $4.99. The upside is that Meanwhile will keep you busy for a long stretch and you will be amazed by the creativity on display. It’s an interactive fiction app that harnesses the power of graphic novels and comics in a make-your-own-adventure style of play. My sixth grade team got an email the other day from our school’s administrative assistant, letting us know that we still have some money in our grade level supply fund and, she urged, we better spend it before the district takes it back. We didn’t even know it was there, so that kind of email is like a holiday cheer for a teacher. My first impulse: let’s get some new books for the classroom. As it turns out, I was starting to go through the application process for Donors Choose to ask for a collection of Choose Your Own Adventure novels as part of my inquiry into Interactive Fiction (I’ve been writing all week about this topic. See my post from yesterday.). 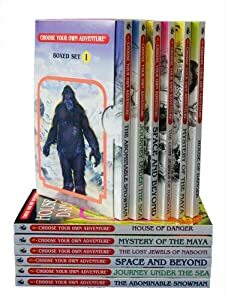 I want to use the Choose Your Adventure books as mentor texts and then shift my students into writing their own multiple ending stories with Twine or some other technology platform. There is another motive here, too, which is to vary the kinds of texts my students are reading. We recently referenced Choose Your Adventure stories, and I read part of one aloud to the class as we collectively chose various story paths, when we were studying Narrative Point of View. It’s not easy to find an accessible second-person-narrative story that works, but Choose Your Adventure stories fit the bill perfectly, and I had a lot of students intrigued by the story. It turns out that this generation of kids haven’t really been exposed to these stories. In the past, I’ve had kids who devoured the Goosebumps series, so they had some understanding of the reader as protagonist. Not many of my students had read Goosebumps, and very few knew about Choose Your Adventure stories. Which is sad, really, since they offer such a different kind of reading experience and interaction. So, I saw the email, dropped out of Donors Choose, and got to work on Amazon, finding books that I could suggest we order for our students. Bingo! I am hoping the plan for a collection of new books is now in motion and my collection of Choose Your Own Adventure books will be coming soon. This video is a great piece about the art of video game storytelling. I like how it broadens the view of what writing can be. 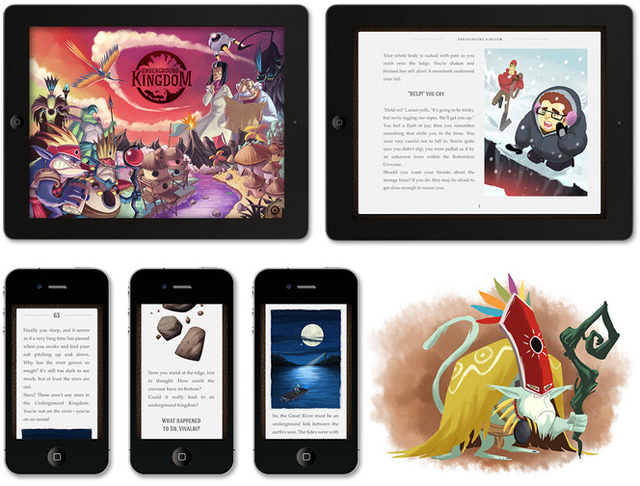 Playfic is a neat site for creating, sharing and playing Interactive Fiction games. While there is a learning curve, one can also creatively “steal” the code from other stories and then revamp them. Here is a handy cheat sheet of commands for playing the games/stories at Playfic. A more advanced tutorial on using Inform 7, the software that Playfic runs off, is here, too, although this is more heady stuff. 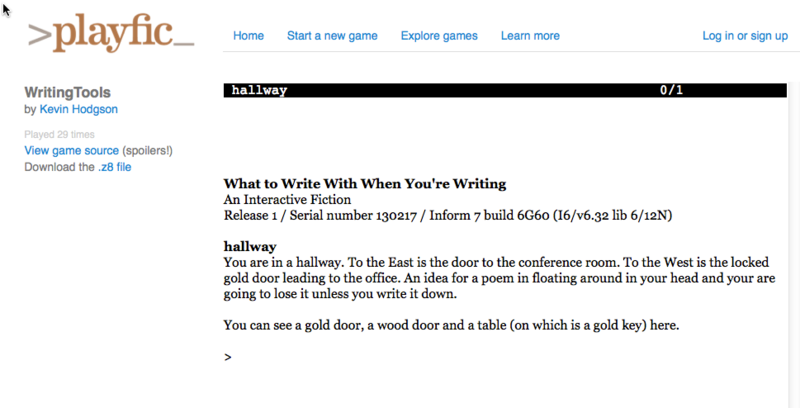 Twine is a free software program for creating hypertext stories, which are different from the typical Interactive Fiction, but in the same vein. (Which reminded me of this article that I read a while back about non-sequential narratives. It’s pretty fascinating.) Chad shared out a few resources that were helpful to me, including this quick tutorial on the basics of Twine. By the way, Eastgate is an online journal for hypertext projects and you can easily get lost in the mix there. There’s some nifty poetry, media projects and stories that pushes the boundaries of our conceptions of writing in a digital space. I am sure there are other hypertext journals out there, too. If you know of more, leave me a comment, won’t you? Jason had his students head to the 2012 Interactive Fiction Competition (who knew?) to play and vote on some stories. 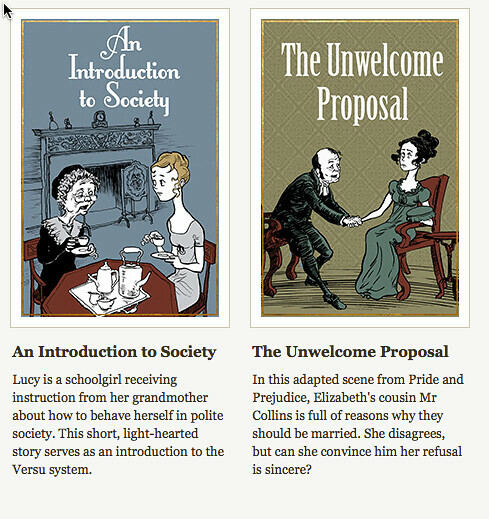 It looks like a nice range of stories that can be played online as well as offline. They might work well as mentor texts. 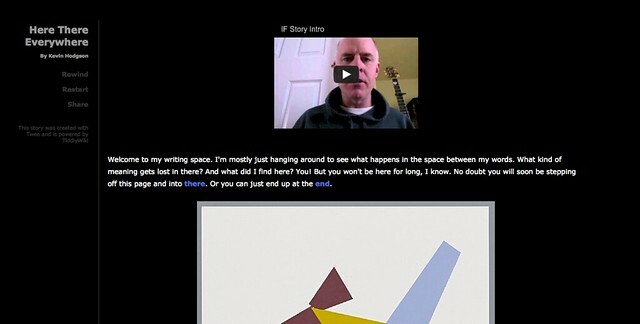 Hypertextopia is another site that allows you to build/construct hypertext stories. It’s been some time since I have explored it, but when I did use it for a story collection, I liked it. Inklewriter is an online space for making linked make-your-own-ending stories that Ryan shared with me on a comment this week. I have not yet tried it (although I have had it bookmarked for a time now) but Inklewriter looks pretty intuitive to use, along the lines of Twine but in an online space (for easier sharing, right?). Finally, all this reminded me of a video series that I made to experiment with annotations in Youtube, using the ‘choose the path’ concept for choices made by the viewer. I used this tutorial to understand a bit about how to use the spotlight/annotation feature in YouTube. I admit: I have not used this with my students, but I would love to do it. I found Twine, a free software program that allows you to make Interactive Fiction, from my friend, Chad, in one of his comments at my blog this week. (Twine is also the name of the new Twitter video app, but they are different programs altogether.) Twine is a program that allows you to map out choices that a reader might make in a story, and then it moves them along various story arcs via hyperlinks. It’s a sort of Make Your Own Ending program. Here is a map to a story that I created, called Here There Everywhere. I like the visual element of story construction and Twine uses that interface as its main element of design of writing. 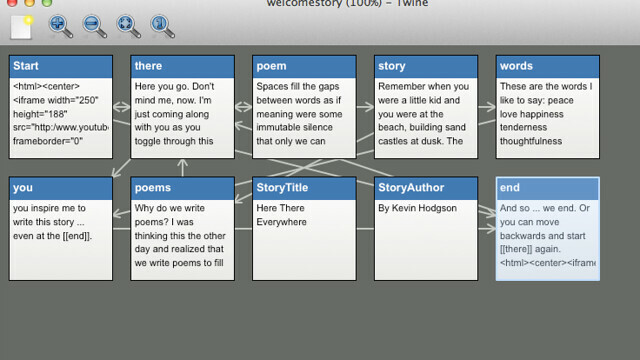 Twine is very different from Inform, which is the software unpinning of Playfic, which I used earlier this week. In Playfic, the reader/player needs to know the commands that will move you through an environment. It is very language-based. With Twine, you just need to make a choice and follow the link left by the writer. In terms of true Interaction Fiction, I think Playfic is the better choice because it becomes more of a game than just a story. In terms of ease of use, Twine wins hands-down, although it is less of game and more of a story. A nice thing about Twine is that it resembles an HTML editor in a lot of ways, so you can embed video, images, audio, etc, as long as they are hosted somewhere online. You can then embed the code right into the story. I did that with my story by adding a video intro and outro to the my story, just as an experiment, and it worked like a charm. One issue with Twine (but not with Playfic) is that the program lives on your computer, so if you want to share your story with the world, you need to host it online. Twine does its part to make it simple, though, by creating your story in a single HTML file. Here’s an easy way to host your file. Use the new Google Drive feature. (Essentially, you create a public folder and pop the HTML file in there, and share the preview link.) That’s what I did with my Twine story. It’s a relatively simple and pretty effective way to host a HTML file. The guy who developed Twine has also developed a bunch of easy-to-follow video tutorials and Chad pointed me to another post that has an easy walk-through of the basics of Twine. Check out my story: Here There Everywhere. Let me know what you think of the story and my reflections. 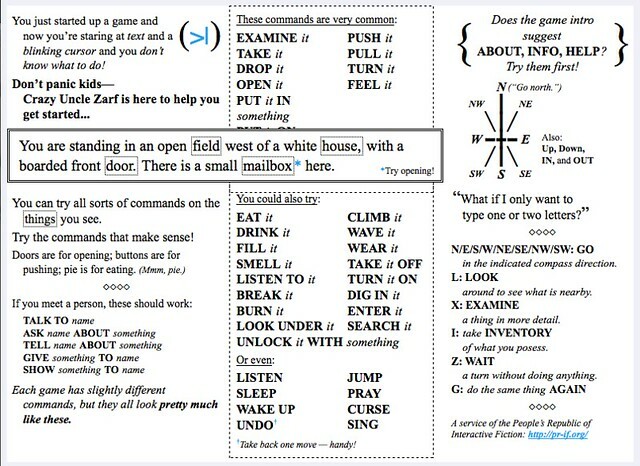 I’m sorting this out as I go, inspired by NWP friend Jason Sellers post on NWP’s Digital Is about Interactive Fiction. I named my Interactive Fiction story What To Write With When You Are Writing because my initial idea was to create a story where the player needs to choose a writing device, and the end result would be to make fun of technology and end up with a pad of paper and pen. Things did not quite go as I had planned, though, and I ended up simplifying the idea considerable. You navigate by using compass directions. In this case, writing “go east” or “go west” will move in that direction. If you there is an object (such as, oh I don’t know, a key, maybe? ), then you need to “take key” in order to have it in your hand. Once a door is unlocked, you need to give directions again on which way to go (east, west). I think all of these hints will help you navigate my story, which ends in a cloud of ideas (you’ll see). Let me know how it goes, please, and what you think. Even in a small, simple story like this, the amount of thought and planning that I did was pretty intense. I had this whole visualization of the hallway and rooms, etc, and creating that experience for others was tricky and challenging (in a good way). I’ve had the idea of trying out Interactive Fiction on the back burner for a long time — at least two years. I even bought a large resource book about Inform (the software built for Interactive Fiction) and did a little bit of research on text-based gaming adventures, but then lost that thread of interest. I can’t say why. I was/am intrigued by the use of writing and language in a gaming system that is not visual, which is such a difference from the video games kids are playing now. Interactive Fiction reminds me a bit of Choose Your Own Adventure stories, mixed with a Dungeons/Dragons map idea and computer programming thrown in (you don’t program code, but it can feel that way at times.) But wrapping my head around the concept was difficult. Then, I saw this post over at the National Writing Project’s Digital Is site by Jason Sellers, explaining how he brought Interactive Fiction into his English classroom, and I got intrigued all over again. While Jason’s high school students are older than mine, I began to wonder what using Interactive Fiction might look like in my sixth grade classroom. Could it work? On the surface, it seems a nice fit: writing and technology and critical thinking, plus publishing for authentic audience. And Jason’s post turned me to a site called Playfic, which is built off the Inform platform, but seems easier to use. The reality is that I needed to dive in myself and figure out what composing Interactive Fiction is really all about. The result was a lot of frustration and then intense exhilaration, and yet, I am still unsure of how I can bring this into the classroom. The frustration began with my story construction. I had this idea of a story in which the player has to choose which writing device to use for getting an idea down: a Tablet, a PC computer or paper and pen. 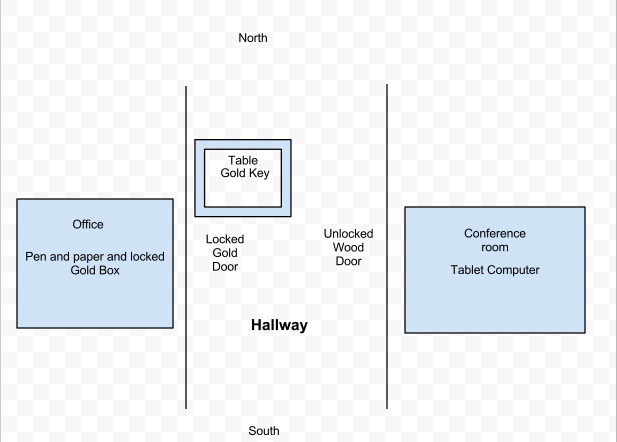 Each device is in a room off a hallway. I drew out a map (see above for a version of the map) to help me think it all through, and then read/played a few stories on Playfic (including Jason‘s). I thought I had the concept down. Writing Playfic games may look like English, but it can be confusing. I thought I was doing it correct but I apparently wasn’t, repeatedly, and I could not for the life of me figure out what was wrong with my writing. Was I missing a word? A punctuation? Was that sentence phrased right? Was it my syntax? It was a bit of a feeling of getting a research paper back in college where you were told you had done it wrong, but the advice to make it better was undecipherable. Looking back, it is clear that I had not grasped (and maybe still don’t) the nuance of the language of Inform/Playfic, and how specific words have specific meaning/power. I almost gave up on my story at that point, and then I was struck with a better idea. Why not use Playfic’s option for looking at the code of other stories, grab someone else’s story, and then rebuild it off the basis of that?